Texas Rangers Cards: Senators Saturday - Ken McMullen, 1967. 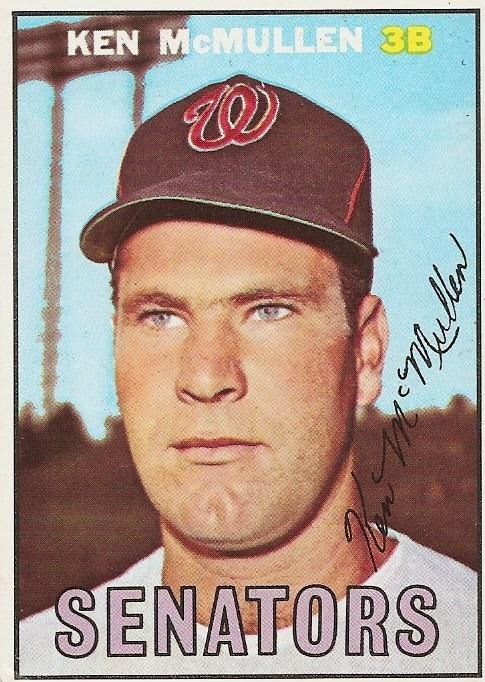 Ken McMullen, shown here on card 47 of the 1967 Topps set, was entering his third full season with the Senators in 1967. He pretty much had the third base spot secured and was looking to keep it. Ken managed to do just that. Over the 146 games he appeared in, Ken McMullen played 1,312 innings at third base and none anywhere else on defense. He made just 18 errors in 519 chances for a .965 fielding percentage. That was good for ten points above the league average. Ken's range continued to be significantly higher than the league average as well. Those numbers weren't in Brooks Robinson territory but they were good enough for McMullen to be considered one of the top defensive third basemen in the Majors. On offense Ken made 619 trips to the plate. That was easily the most on the team, even more than Frank Howard. Ken's .245 batting average was third best among Washington regulars and his 46 walks managed to bump his on-base percentage up to .301. McMullen still had moderate power, his .377 slugging percentage was tied for second best in the starting lineup. He hit 22 doubles (best on the team), two triples, and 16 home runs (best on the team among players not named Frank Howard). All in all, 1967 was a successful season for Ken McMullen. He continued his great defense and his production at the plate continued as well. The Senators would have liked to see more pop from him offensively but it was nice to have third base covered well for the past three seasons. Things were looking up. If he could avoid injury and stay consistent, Ken McMullen and the Senators had nothing to worry about at third base in 1968.